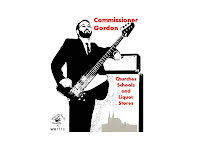 A well respected bass player around town, Commissioner Gordon (yes, he actually served as a commissioner!) gets to display his full talents on "Churches, Schools, and Liquor Stores" - songwriter, singer, screamer, mandolinist and guitarist. Don't be fooled if the opening drumbeat reminds you of Toni Basil's "Mickey", for soon the Commissioner's big scream kicks off the psychotica gadda vida riff that is "Crypobiotic" - a paean to the living earth that supports desert fauna and for some reason reminds him of a "girl who's like no other - she's Cryptobiotic!" "Out of Town Romance" will make you longingly look back at those days when you dated someone who wasn't just across town - they were across the state, across the country or across the ocean. There are some fat horns and a honking tenor sax solo laid down by Chris Watling of the Grandsons. "Mr. Good Enough" should make all the ladies swoon with being understood, even though it's telling them all to lower their expectations..."he may not be Mr. Right, but he'll be your Mr. Good Enough". Take heed, girls! And Buddy Holly fans - take note of the drum (singular)! "Evil Clowns" is the song for everyone who has a fear of clowns...rightfully so in some cases. We know some good clowns, but it seems like the Commissioner's nightmares are filled them - "No one sleeps when they're in town!" "Somebody Else" is a song for the sad sacks who think they're never ever gonna get that girl...but they do. The Commish did! The drumming throughout this EP is great but Todd Vestibule's drumwork on this one is stellar and hypnotic when in isolation. "Jeremy Bentham" is a song about English philosopher Jeremy Bentham. Tell you what, if you want your life's work to be remembered 200 years from now, why don't you just set up your skeleton in the hallways of a local university! "I saw the King, and the Acid Queen, but best of all, I saw Jeremy." "Just Like Venus" just might be the best lyric amongst a host of great lyrics. "I saw my friend Milo just the other day..." And hey, if you're not a words person, this rockin' number gets up and goes. "I Had to Tell You" is a heartfelt cover of Roky Erickson and the 13th Floor Elevators. The guitar and mandolin reveal the bluegrass side of the Commish. The bonus live version of "Jeremy Bentham" was recorded at the Live Arts Fest in Charlottesville with Bombpop. Musicians aiding and abetting are Todd Vestibule (d), Baby Doc Martens (b), Jamie Orchard-Hays (g), Ergle Flumg (g), Mr. Chia Chen Lee (g), Maynard Sipe (g, d), Chris Watling on tenor and baritone sax. It was recorded at Bebop Studios in Rockville, MD, Recording Arts in Fairfax, VA, PMD Recordings in Charlottesville, VA, Corner Canyon Studios in Draper, UT, and Jabb's in Long Beach, CA.